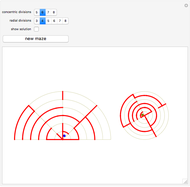 This Demonstration generates mazes on a cone, including its circular base. The blue and brown dots mark the beginning and end of the maze. 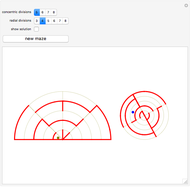 The left image is a view from directly above the point of the cone, split along a radial line to distinguish it from the base image on the right. Izidor Hafner "Mazes on a Cone, Including Its Base"